February was filled with nail mail. Lots of it. Plus I went to Toronto... Let's see how I did! I received a package from my dear friend Anissa with so many goodies! Plus some stuff I had sent to her address. Gotta love my US ladies for hooking me up! Now! Ready to see my haul from Toronto? It is tiny!! I was sooooo good. 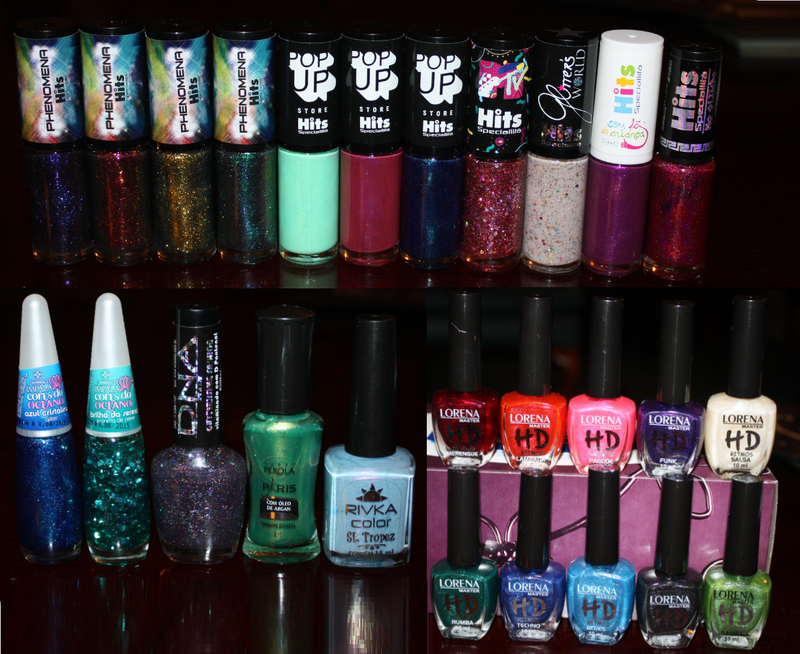 I came home to more AMAZING nail mail! Holy crap! My friend Marília from Brazil sent me all these goodies in a secret swap. I'm blown away! As Penny from The Big Bang Theory would say, holy crap on a cracker. That's 85 new polishes. But I think I bought like 26 of them. So that's not too bad... Right? This polish is just stunning. The color of the glitter is so awesome, and it is holographic too but you can't really see it in my photos. Believe you me, none of the photos of this polish floating around truly do it justice. It is so beautiful! I don't stand behind Lynnderella and her practices but this polish was a gift from (again) the amazing Jini from MakeUpMom123, and I treasure it for its beauty! I layered it over black to make the teal really pop! It is also gorgeous over dark blues and teals and other glitters... Anything! I did recently pick up a glitter that is similar in color, which could satisfy a lemming for some of you. Sephora by OPI - I'm So Sari! My nails were like little blue-teal gems. So sparkly and eye-catching, just gorgeous! Thanks again Jini for this amazing polish! Hola! Happy weekend! Another indie glitter polish for your viewing pleasure today. I know I've been posting a lot of indie swatches lately, it's because I just keep wearing fun glitters! I can't help it. I hope you guys don't mind! Today I've got a polish from another brand I had yet to try, 365 Days of Color. This sugary sweet polish was sent to me for Valentines Day by the lovely Jini aka MakeUpMom123. It is a sheer pink shade with pink and red glitters, including circle glitters. Shown is three coats. I LOVE THE CIRCLES. I don't know why. Circle glitter is just fun. Gimme all the circles. If you don't like visible nail line, this is not the polish for you, but I like a nice sheer every now and then! I'm into it. Thank you, Jini! Hey guys! As this post goes live, I will be somewhere in the air over Canada, headed to Toronto for a week! Never fear, I've got posts all lined up so it won't be lonely here on RLN. I'm starting this group of scheduled posts with a real stunner! Lkejhdfwedowkedokefejnf I love this soooooooo much. So much. Bunch of pictures to display my love. I recently received this polish from my friend Anissa. It was a longtime lemming of mine! And I'm so happy to finally have it. Here we have a crazy bright fuchsia that dries to a semi-matte finish. Kinda sheer, this is 2 coats and you can see my nail line in the photo, but not as much in person. I think this was a fantastic base color for the flakies! So happy to finally have this beauty in my collection. I don't know why I didn't buy it when it first came out. I'm dumb. I wonder what goodies I will bring home from Toronto... You'll have to check back in a week and see! Last month at Sally's, you got a free bottle of China Glaze if you bought a bottle of Seche Vite. Of course I used that opportunity to stock up on SV and get some free CG! It was hard though, because I have pretty much all the good colors that Sally's carries... Haha! Here's one of the colors I chose. Holy neon! Super fluorescent hot pink neon polish with a good formula, 2 coats. Some people say wearing neons in winter is a faux-pas but I don't mind. That being said, I didn't love the color. A bit too neon for my liking, maybe. I added some black and white glitter to the mani! I added one coat of Lynnderella - Connect The Dots and one coat of Ninja Polish - Sticks 'n Stones. I like mixing the two polishes because I think it gives a nicer mixture of glitter pieces than either on their own. Did you get any free CG at Sally's last month? What did you pick?